Quote: "This human was originally interpreted as having a minor, but detectable, contribution of marine protein in its diet (47). Redating of Paviland 1 to ≈33,000 cal BP (48) means that we can now compare the human isotope values to fauna dating to an earlier period." The oldest known buried remains in Britain are 29,000 years old, archaeologists have found – 4,000 years older than previously thought. The findings show that ceremonial burials were taking place in western Europe much earlier than researchers had believed. New dating techniques developed by Oxford University and British Museum researchers have pinpointed the age of the ‘Red Lady’ burial in Wales, previously thought to be 25,000 years old, to 29,000 years old. The finding suggests that the origins of human burial may be found in western Europe, and perhaps Britain, rather than elsewhere, although further dating work is required. The skeleton of the ‘Red Lady,’ actually that of a young male, is housed in the Oxford University Museum of Natural History, having been first discovered and excavated in Wales in 1823 by William Buckland, then Professor of Geology at Oxford University. The ‘Red Lady’ owes its name to the red ochre covering the bones. The burial site lies in Goat’s Hole Cave, Paviland, on the Gower Peninsula in Wales. Ivory ‘wands,’ bracelets, and periwinkle shells were found near the remains when the site was excavated. The remains and artefacts were previously difficult to date accurately. ‘Many of the bones were treated with preservatives in the 19th century, and some of this contamination is persistent and often difficult to remove,’ says Dr Thomas Higham, Deputy Director of Oxford’s Radiocarbon Accelerator Unit. With Dr Roger Jacobi of the British Museum and colleagues, he applied an improved chemical preparation technique for removing small contaminants from bone collagen, which was applied to a piece of rib and a fragment of collar-bone from the skeleton. This ‘ultrafiltration’ technique allowed more accurate radiocarbon dating than had previously been possible. The discovery sheds new light on human behaviour at the beginning of the Gravettian period of the European Palaeolithic. The new date is the earliest direct date for a human from this time period in this part of the world. The ‘Red Lady’ is part of a small group of elaborate burials dating from the Gravettian period of the Upper Palaeolithic, with some found as far west as Portugal, and as far east as Moscow. Their graves frequently include the bones of dangerous herbivores, ochre, and the decoration of body or clothing with beads, often manufactured from shells. The new dating technique has revealed that the ‘Red Lady’ lived in Britain during interstadial, or warmer conditions, rather than a cold spell as previously thought. In the mid-20th century scientists dated the remains to about 18,000 years ago, at the height of the Glacial (cold) period, using the then recently-developed radiocarbon method. 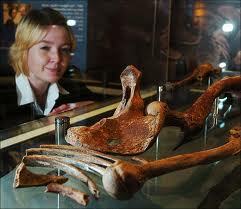 Later the specimen was re-dated to between 25,000 to 26,000 years. The current research shows that the remains are even older. Another find not a million miles away at Kent's cavern (Devon) has also had its dates drastically changed, which is changing our understanding on the evolution of man and the extent, duration and severity of the last ice age. "The earliest anatomically modern humans in Europe are thought to have appeared around 43,000–42,000 calendar years before present (43–42 kyr cal BP), by association with Aurignacian sites and lithic assemblages assumed to have been made by modern humans rather than by Neanderthals. However, the actual physical evidence for modern humans is extremely rare, and direct dates reach no farther back than about 41–39 kyr cal BP, leaving a gap. Here we show, using stratigraphic, chronological and archaeological data, that a fragment of human maxilla from the Kent’s Cavern site, UK, dates to the earlier period. The maxilla (KC4), which was excavated in 1927, was initially diagnosed as Upper Palaeolithic modern human1. In 1989, it was directly radiocarbon dated by accelerator mass spectrometry to 36.4–34.7 kyr cal BP. Using a Bayesian analysis of new ultrafiltered bone collagen dates in an ordered stratigraphic sequence at the site, we show that this date is a considerable underestimate. Higham T, Compton T, Stringer C, Jacobi R, Shapiro B, Trinkaus E, Chandler B, öning F, Collins C, Hillson S, et al. 2011. The earliest evidence for anatomically modern humans in northwestern Europe. Nature. Thanks both for your erudite posts. Still wondering how C13 is used for dating? Anybody have a good link? It seems to me the real breakthrough in the Oxford work was related to reducing contamination. C13 is a cross-check and tells us more about diet - it is not a new way to establish dates. Is this the daftest question ever? Two Altar Stones at Stonehenge? Was Stonehenge a Neolithic pergola?